Eighty years ago, the working class and poor peasants of Spain rose up against capitalist exploitation, dire poverty and fascist forces – a high point of years of struggle. At times, they held power in their hands. July 2016 marks the 80th anniversary of one of the greatest struggles in the history of the international working class: the Spanish civil war and revolution. At the time it aroused the workers’ movement internationally as thousands flocked to join the international brigades and fight the fascist forces led by General Franco. From Britain, miners, dockers, printers and others went to fight the fascist threat. Among them were George Orwell, the socialist writer, and Jack Jones, who was to become the left-wing leader of the powerful Transport and General Workers Union (forerunner of Unite) in the 1970s. The victory of Hitler and the Nazis in Germany in 1933 made the threat of a further fascist victory in Spain all the more important. The wounds left by this struggle remain unhealed in Spanish society to this day, including the issue of recognition for the disappeared and executed. The campaign to change the street names commemorating fascists in Madrid is an illustration about how deep the wounds go. Leon Trotsky, co-leader of the 1917 Russian revolution, pointed out that in this epic battle the heroic Spanish working class could have made not one but ten revolutions. Tragically, despite their monumental efforts, the revolution was defeated and Franco’s fascists came to power establishing a brutal regime that was to last for four decades. An estimated 200,000 died during the civil war with an equal number killed in the years that followed. Had the Spanish revolution triumphed it would have changed the course of European and world history. It could have prevented the awful carnage that was to ensue in the second world war. Nonetheless, crucial lessons can be learnt from this bloody defeat for a new generation of workers and young people in the struggles against the far-right, racism and capitalism. In February 1936, the Popular Front coalition was swept to power in elections. This was to unleash a revolutionary movement by the working class and poor peasants – and a fascist revolt from the military which opened up a bloody civil war. The victory of the Popular Front had followed years of upheavals and struggles by the working peoples of Spain. Following the election victory in 1931 of the republican and socialist parties, King Alfonso abdicated. A strike wave followed and a series of reforms was implemented but capitalism was not overthrown. Elections in 1933 resulted in the monarchists making a comeback and the reversal of the reforms won previously. In October, 1934, a revolutionary uprising with mine workers at its epicenter, the Asturian commune, was crushed. At least 5,000 were killed and 30,000 imprisoned. This was a precursor to the revolutionary events to erupt two years later. It was similar to the defeat of the Russian revolution in 1905 which was a dress rehearsal to the revolution in 1917. The Popular Front was a coalition of the Partido Socialista Obrero Español (PSOE), the Partido Comunista de España and so-called “progressive,” “liberal” and republican parties: the Izquierda Republicana, the Unión Republicana, the Esquerra Republicana de Catalunya (Catalan sister party of IR), other smaller Catalan and Galician parties, and was soon joined by Basque nationalists. It was the coalition with these supposedly progressive capitalist forces which proved to be a fatal policy. The disastrous “stages theory” adopted by Joseph Stalin and the Communist International in Moscow, which dictated policy to the communist parties around the world, was to drown the Spanish working class in blood. It is still applied by the Communist Party and some others on the left today. It was justified by claiming that it was necessary to develop capitalism further in economically backward countries – like Spain at the time, where 70% of the workforce labored on the land – before passing over to introduce socialism. Therefore, the stages theory went, it was necessary to win over “progressive” capitalists and not to provoke them by adopting measures deemed to be too radical. Moreover, once the Spanish fascist forces had mobilized, it was argued that the priority was to defeat Franco and this meant that a bloc with the “progressive” capitalists was required to stop them being driven into his arms. The same policy was applied decades later in Chile, under Salvador Allende’s Popular Unity coalition (1970-73), with equally devastating consequences for the working class. The experience of the victorious Russian revolution in October 1917 demonstrated that capitalism could not be developed in economically backward countries where a large peasantry existed. The weak indigenous capitalist class of these countries was completely tied to the banks and economies of the imperialist powers – and the capitalists and landowners were inextricably linked together, too. In such a situation, industrial and economic development – along with democratic and workers’ rights, and the right to national self-determination – could only be achieved by the working class, with the support of the poor peasantry, introducing a socialist plan for the economy and running society democratically. This would need to be linked with the working class in the more powerful capitalist economies and the formation of a socialist federation of countries. The supporters of a modern-day version, including some on the left in Podemos, advocate as a first stage the defeat of “neoliberal capitalism.” The utopian idea of establishing a ‘more humane’ capitalism lies behind this position. They forget that even ending privatization and austerity, while welcome, would not in and of itself end the misery, poverty and exploitation that capitalism as a system means. This is especially true in today’s era of global turmoil, stagnation and crisis. The horrific conditions suffered by the working class and poor will not be ended by merely replacing one set of capitalist policies with another while leaving the system intact. The capitulation and betrayal by Syriza in Greece to EU-led austerity show in practice where such a policy will lead. While it is crucial to fight for every possible reform and concession for the working class, if this is not linked to a struggle to defeat capitalism and introduce a socialist alternative then such reforms will not be sustained on a lasting basis. The Spanish revolution has crucial lessons for the new left parties emerging today, like Podemos and Izquierda Unida in Spain, Die Linke in Germany, or the Partido Socialismo e Liberdade (PSOL) in Brazil. The idea of joining a coalition with the former mass parties of the working class – like PSOE, the SPD or Brazil’s Partido dos Trabalhadores (PT) – is a potential road to disaster. They have become wholly capitalist parties and have carried out pro-capitalist policies when in government. Rather than pushing such parties to the left by joining them in government, the new parties would become prisoners in coalitions at regional or national level. As events in Spain showed 80 years ago, this can only pave the way for defeat. This was also illustrated by the collapse in Italy in 2008 of Rifondazione Comunista (PRC), which had joined numerous compromising coalitions. 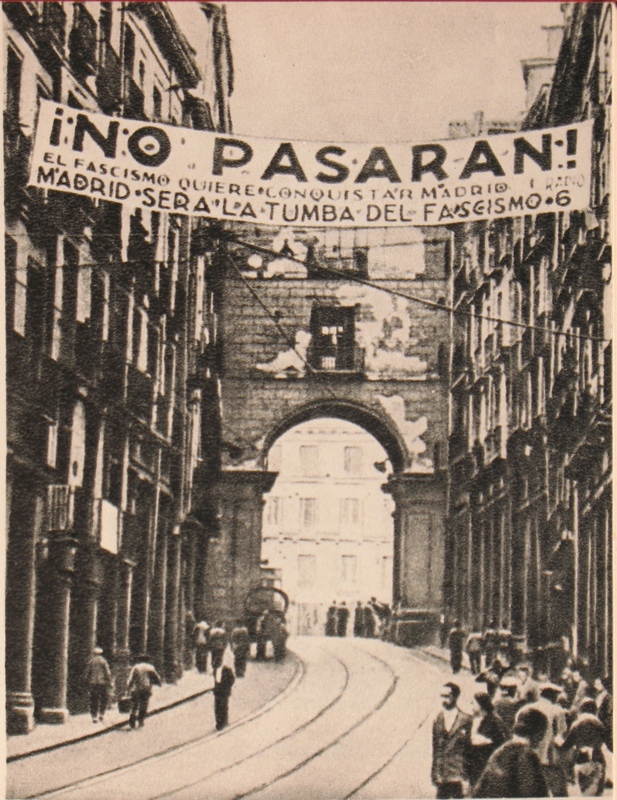 The election victory of the Popular Front in Spain in 1936 acted as a trigger for the masses. They did not wait for the government to enact its program in parliament. They took to the streets and implemented it themselves within 48 hours. Managers with known links or sympathies to the fascists were driven out of the factories. A 44-hour week was introduced by the workers. Land and factory occupations took place. Sacked and victimized workers were given their jobs back. An estimated 30,000 political prisoners were released from the jails. The “liberal” capitalists only wanted a return to the 1931 constitution and took measures to try and protect themselves economically by raising prices and other measures. This provoked further upheavals. The temper of the Spanish workers was indicated by the estimated 113 local general strikes in the five months following the election of the Popular Front! It was this massive revolutionary wave that terrified the ruling class, rather than the election of the Popular Front per se. During this period, the fascist forces, bosses and landowners plotted and prepared. On July 17, the fascist revolt began with a military rebellion in Morocco which had been left in the hands of Moorish mercenaries and legionnaires. The capitalist parties in the Popular Front did not really represent the capitalist class but, as Trotsky pointed out, its “shadow.” The capitalists had gone over en bloc to the fascist rebellion to defend their own interests. Yet the shadow of Spanish capitalism was to act as a Trojan horse inside the Popular Front. While the ruling class made its plans with the fascists, the government attempted to negotiate with the conspirators. Yet the masses did not hesitate – the workers of Barcelona to the fore. They immediately took up the struggle, understanding the threat posed by the fascists. They had experienced the massacre of the Asturian commune in 1934 and the two years of brutal repression that followed. Hundreds of thousands took to the streets throughout Spain, clamoring for arms to fight the fascists, but the government refused their demands. Had it been left to the deliberations of the Popular Front government, it would probably have capitulated to the military revolt. The masses did not allow it this luxury. On July 19, the working class of Barcelona took matters into its own hands and stormed the first barracks as the military were preparing to mobilize. Armed with chair legs, sticks of dynamite taken from building sites, a few sports rifles and weapons obtained from friendly local police, they confronted the military. Fighting like lions and appealing to the rank-and-file troops they scored an historic victory. Felix Morrow recounted in his outstanding book, Revolution and Counter-Revolution in Spain, that “By 2pm the next day they were masters of Barcelona”. Within days the whole of Catalonia was in the hands of the working class. This was echoed in Madrid where the government had also refused to arm the working class. In Málaga, a crucial port city facing Morocco, workers took the ingenious step of lighting a fire-wall around the barracks to prevent the military from leaving. As the movement spread, up to four-fifths of Spain was effectively under the control of the working class and peasants. The initiative had passed out of the hands of the ‘liberal’ capitalists. However, despite the tremendous display of heroism and ingenuity, the working class was blocked by the role and policies of its parties and leaders. The lack of a mass Marxist party with a clear program to organize, consolidate and take the revolutionary gains forward, snuff out capitalism and establish a workers’ democracy, was to prove fatal. The most pernicious role was played by the Stalinist leadership of the Partito Comunista de España (PCE) which most explicitly defended the stages theory. It became the driving force enabling the capitalist class eventually to claw its way back, disband the mass workers’ militia and derail the revolution. Along the way, the Stalinists carried out brutal repression against others on the left who opposed them, like the Partido Obrero de Unificación Marxista (POUM), established by former Trotskyists and part of the Popular Front. One of its leaders, Andrés Nin, was tortured and executed by the PCE or its agents. The same fate met many others on the anti-Stalinist left. These brutal actions were directly linked to the political counter-revolution which was under way in the Soviet Union. Even agents or representatives sent to Spain by Stalin’s regime in Moscow, who had been affected by the revolution, were executed upon their return home. This was the case with Vladimir Antonov-Ovseyenko, Russia’s ambassador to Spain. He had sent reports back to Moscow urging Stalin to support the revolutionary struggles taking place. Initially, the Stalinists had not been a strong force in Spain. They conquered their position largely due to a mistake by Trotsky’s supporters in Spain (part of the International Left Opposition) when they did not accept the offer made by PSOE’s youth federation in 1934 to join and help “Bolshevize” it. This was despite Trotsky urging them to do so. This was a contributing factor allowing the Stalinists the opportunity to jump in and build a strong base. For its part, PSOE was split into two wings: the right led by Indalecio Prieto and the left by Largo Caballero. Caballero did not start politically on the left. He had served as a councilor of state in the right-wing dictatorship of Primo de Rivera of 1923-30. Yet his own experiences, especially the effects of the revolutionary movement, drove him to the left. A similar development has been seen during other periods of mass struggle. It happened to Tony Benn in the late 1960s and 1970s. He was from an aristocratic background and had served in Harold Wilson’s government, being in the “center” or on the “right-wing” of the Labour Party. However, he became radicalized by his experiences and the workers’ struggles of the time. The same can be seen today in the US presidential election, where Bernie Sanders has been pushed further to the left by the millions drawn around his campaign. In Spain, reflecting the revolutionary upheavals, it went much further. Caballero, a former leader of the Unión General de Trabajadores (UGT – the trade union linked to PSOE), was to become known as the “Lenin of the Spanish revolution.” Unfortunately, he was not capable of drawing the same political conclusions as Lenin did in Russia and his mistakes contributed decisively to the defeat in Spain. The revolutionary sounding phrases and declarations made by him and leading PSOE lefts were not matched by concrete deeds and actions. The divisions in PSOE between these two wings prior to the fascist revolt were heading towards a split in the party. Prieto succeeded in forcing a postponement of the party congress. The executive outlawed Caballero’s newspaper, Claridad, and reorganized the districts controlled by him. Then, as the revolution and civil war broke out, Caballero’s wing, despite having a majority in PSOE, allowed Prieto to keep control of the party headquarters on the basis of maintaining “harmony.” They then desisted from any further steps to take control of the party. There are lessons here for Britain today and Jeremy Corbyn’s attempt to appease the Blairite right-wing of the Labour Party and not confront them. At the height of the revolutionary fervor, Caballero criticized the Prieto, Stalinist and bourgeois elements in the government. However, with no clear alternative or willingness to carry through the revolution to a conclusion, he drew ever closer to them until he headed the government in September 1936. He presided over measures he had previously criticized, such as steps to disband the militias and replace them with a separate military unit under government control – an attempt to rebuild a capitalist state machine. Eventually, the central committee of the militias was dissolved and its powers handed over to the ministries of defense and internal security. Having served his usefulness to the counter-revolutionary forces, Caballero was removed as prime minister in May 1937. The Popular Front coalition proved to be a decisive block on the working class and had disastrous consequences. In Catalonia, the anarchist Confederación Nacional del Trabajo (CNT) had a mass base. In its ranks were among the most revolutionary workers. Yet anarchism’s ideological denunciation of the state in general led the anarchist leaders to be incapable of distinguishing the difference between a workers’ state and a capitalist state. That confusion even resulted in the contradictory situation whereby an anarchist organisation (opposed to any state) entered the Caballero-headed government in Madrid. The CNT also joined the government in Catalonia (known as the Generalitat) alongside capitalist parties. Its leaders failed to use the power and influence the CNT had for fear of provoking a “civil war within a civil war.” Yet this was already happening as the counter-revolution advanced, carrying out an onslaught against the gains won by the working class. Events came to a head in Barcelona in May 1937 when government forces attempted to take over the telephone exchange, a bastion of the CNT and the revolutionary workers. This was a provocation, a challenge to the power of the working class. Workers throughout Barcelona rallied against the assault. Barricades were set up all over the city triggering a new upsurge in the struggle. This was a symbol of the dual power which had developed throughout Spain. It arises in every revolution, where there is a balance in the running of society: the ruling class is too weak to control events, but the working class has not consolidated its running of society. Such a situation cannot continue indefinitely. Either the working class must establish its own state or the ruling class must take power back into its own hands. The other party that could have offered a way out of the deadlock was the POUM. It had exploded from 1,000 members to 30,000 in just six weeks as events unfolded in 1936. By the end of that year it had grown to approximately 70,000. It was based mainly in Catalonia and had adopted a more combative revolutionary role, but had also made serious mistakes. At one stage, it joined the Generalitat before being kicked out in December 1936. This disorientated sections of workers. By June 1937 it was outlawed by the central government and its leaders arrested. At the same time, the POUM sought to hang onto the coat-tails of the CNT leaders, conducting diplomatic discussions with them behind the scenes, rather than strike out with a bold independent policy. Instead of sending its militants into the mass ranks of the CNT workers in Catalonia, it worked with the much smaller UGT union. Rather than agitate for a bold revolutionary policy among the ranks of the CNT militia, it formed its own separate detachments. With a bold socialist program it could have reached the most revolutionary workers among the CNT anarchists who opposed their leaders’ policy. In particular, the POUM could have reached out to the forces organised on the Aragon front around the Friends of Durruti who were advancing militarily. Here they fought as an army of social liberation rather than separating the military struggle against the fascists from the social revolution. Had the POUM acted in this way, a genuinely mass revolutionary Marxist party could have emerged. Yet, is it really possible that such a force – mainly based in Catalonia – could have turned the tide of the civil war? The short answer is yes, given the scale of the revolutionary movement, the mass mobilization and radicalization. Had such a party emerged it could have taken the steps needed for the working class to take power in Catalonia. From there its appeal could have been spread rapidly to the rest of Spain as an example to follow. By failing to act in this way, however, the POUM missed a golden opportunity – and that opened the road to the fascist victory. One of the steps necessary to take the revolution forward to victory was the establishment of workers’ councils. These were not formed during the Spanish revolution, one of its crucial weaknesses. None of the parties supported their formation or took steps to initiate them. The workers’ councils (known as “soviets” in Russia) which emerged during the Russian revolution were comprised of delegates elected from the workplaces, all subject to recall. Each party contested elections and the soviets became both organs of struggle and the potential base for a new workers’ state when linked together in regional and national congresses. The left-wing of PSOE opposed the formation of workers’ councils and argued that PSOE should play such a role. They also supported a fusion with the Stalinists. In other words, the task should wait until a majority of workers had decided to join the PSOE! In Spain, the committees that were formed mainly comprised representatives from the different parties – rather than involving, representing and organizing the masses engaged in the revolutionary movement. The militias were separate and organised on a party basis. In the militias, the party leaders appointed the commanders. The civil war continued until 1939 when Franco eventually triumphed. The defeat in Barcelona in 1937 had been a turning point. From then on it became more of a military conflict as the masses became increasingly dispirited and defeated. Paradoxically, the civil war ended with dictatorship in both parts of Spain as the “republican” Colonel Casado, together with José Miaja, seized power from the ‘democratic’ republicans and opened up peace negotiations with Franco. These ended in the collapse of the republican controlled areas and Franco becoming dictator of Spain. Modern day Spain is vastly different from that of the 1930s, and the battles in the coming years will take a different form. Yet the lessons to be learnt from the struggles of the working class during the revolution, and the events in the civil war, are invaluable for workers and young people internationally in the struggle against racism, the far-right and capitalism. If these lessons are learnt then the sacrifices made by that heroic generation will not have been in vain. July: fascist rising begins in Morocco, spreading to Spain.